After accepting the Republican nomination with a terrific speech Thursday night, former Governor Mitt Romney is flying to the New Orleans area Friday to inspect storm damage caused by Hurricane Isaac. Romney will meet with Gov. Bobby Jindal and first responders and thank them for their work and see areas impacted by the storm. Romney found it important enough to make such a visit that he is skipping a previously scheduled rally with his vice-presidential running mate Paul Ryan in the battleground state of Virginia this afternoon. Romney's presidential-like storm damage inspection stands in sharp contrast to President Obama, who has been too busy flying around the country conducting campaign rallies in Iowa, Colorado and Virginia and has not even announced any plans to visit the storm ravaged area. Ike passed over Houston before dawn, blowing out windows in the state's tallest building, the 75-story Chase Tower. Behind splintered shards, desks were exposed to the pounding morning rains, metal blinds hung in a twisted heap from some windows, and smoky black glass covered the streets below. Shortly before noon, Houston police cars prowled downtown, ordering citizens off the streets over bullhorns: "Please clear the area! Go home!" Chunks of glass were still plunging from Chase Tower, threatening to injure nearby gawkers. In Louisiana, Ike's storm surge inundated thousands of homes and businesses. In Plaquemines Parish, near New Orleans, a sheriff's spokesman said levees were overtopped and floodwaters were higher than either hurricane Katrina or Rita. Ike landed near the nation's biggest complex of refineries and petrochemical plants. Fears of shortages pushed wholesale gasoline prices to around $4.85 a gallon, up from $3 earlier in the week, and at least eight refineries were shut down. But it was too soon to know how they fared. Fires burned untended across Galveston and Houston. Brennan's, a landmark downtown Houston restaurant, was destroyed by flames when firefighters were thwarted by high winds. Fire officials said a restaurant worker and his young daughter were taken to a hospital in critical condition with burns over 70 percent of their bodies. As Ike moved north later Saturday morning, the storm dropped to a Category 1 hurricane with winds of around 80 mph. At 11 a.m. EDT, the center was about 20 miles north-northeast of Huntsville, Texas, and moving north at 16 mph. It was expected to turn toward Arkansas later in the day and become a tropical storm. More than 3 million customers lost power in southeast Texas, and some 140,000 more in Louisiana. That's in addition to the 60,000 still without power from Labor Day's Hurricane Gustav. Suppliers warned it could be weeks before all service was restored. It could have been worse. Was the National Weather Service's "certain death" warning overdone? The weather service painted a vivid picture in its warning of the destruction it expects: a towering wall of water -- possibly up to 22 feet high -- crashing over the Galveston Bay shoreline as the brunt of Ike comes ashore. That wall of water could send floodwaters surging into Houston, more than 20 miles inland. "All neighborhoods ... and possibly entire coastal communities ... will be inundated during the peak storm tide," the weather service warned. "Persons not heeding evacuation orders in single family one or two story homes will face certain death." The last time the weather service used such language was for the August 2005 warning for Hurricane Katrina, "most of the area will be uninhabitable for weeks ... perhaps longer" and that people and animals "exposed to the winds will face certain death." "If this offended anybody, I personally apologize," Fowler told ABC News. "It was a mistake, and it was a satirical statement made in jest. And one that I clearly don't believe." My RedState colleague, Absentee, caught the uncaring Fowler making his inappropriate comments on an airline flight from Denver, Colo., to Charlotte, N.C., following the Democratic National Convention. "The hurricane’s going to hit New Orleans about the time they start. The timing is -- at least it appears now that it’ll be there Monday. That just demonstrates that God’s on our side. [Laughter] Everything’s cool." I'll bet that doesn't seem very funny to all the folks being evacuated in the face of Hurricane Gustav. You can watch the video of Fowler's indiscretion here. Fowler didn't learn his lesson very well. The Former Chairman of the Democrats offered a political required, if insincere apology. Fowler then went on to insult Absentee -- calling him "some right-wing nutcase." A 6.6 magnitude earthquake shook Hawaii early Sunday, blocking a major highway on Hawaii Island and knocking out power across the state. The quake hit at 7:07 a.m. local time, 10 miles north-northwest of Kailua Kona, a town on the west coast of the Big Island, said Don Blakeman, a geophysicist at the National Earthquake Information Center, part of the U.S. Geological Survey. The quake was followed by several strong aftershocks, including one measuring a magnitude of 5.8. So far it appears Hawaii was fortunate. UPDATE: Hawaii Governor Linda Lingle issued a disaster declaration for the entire state. The disaster zone stretched across hundreds of square miles of mostly farming communities in Yogyakarta province. The worst devastation was in the rice-farming town of Bantul, where more than 2,400 people were killed and 80 percent of the homes were flattened. About 450 aftershocks had shaken the region as of midday Sunday, with the strongest measuring magnitude-5.2, said Handi, an official at the Meteorology and Geophysics Agency who uses only one name. Survivors searched the ruins of their homes on Sunday for anything still usable and complained that they hadn’t received any aid. “We’re short of everything — clothes, food, water, all are gone. We are poor people, but our lives still matter,” said Budi Wiyana, 63, whose house was destroyed. Doctors struggled to care for the injured, hundreds of whom were lying on plastic sheets, straw mats and even newspapers outside overcrowded hospitals, some hooked to intravenous drips dangling from trees. Bloodstains littered the floor at Yogyakarta’s Dr. Sardjito Hospital, along with piles of soiled bandages and used medical supplies. The death toll expected to rise further. Please go to "How To Help Indonesian Earthquake Victims" and consider donating to one of the charities helping with the relief effort. By now you have probably heard about the powerful earthquake that hit Indonesia this morning killing thousands of people and injuring thousands more. While not as devastating as the 2004 tsunami, Katrina or the 2005 South Asia Earthquake, aid organizations are already asking for donations to help with the relief effort. 888-256-1900 (toll-free) Mailing Address: Mercy Corps, Dept W, P.O. Box 2669, Portland OR 97208 Click here to donate to this organization. US citizens can make a tax-deductible online donation on Oxfam America's website. Click here to donate to this organization. Contact information for these organizations is available here. Give To An Established Charity: Don't let an unscrupulous charity take advantage of your goodwill. Find a charity with a proven track record of success with dealing with this region and this type of disaster. Even well-meaning new organizations will not have the infrastructure and knowledge of the region to efficiently maximize your gift. If you do feel compelled to give to a new charity, be sure to get proof that the group is in fact a registered public charity with 501 (c) (3) status. Designate Your Gift: Worried that your donation will go towards the charity's general operating fund or saved for an upcoming crisis? This is a very understandable concern. Many charities do encourage donors not to designate their gifts so that the charity can decide how best to utilize the money, but depending on your confidence in the charity's ability to make that determination, you may want to tell the charity exactly how to use your gift. By designating your gift specifically for the earthquake relief efforts, you'll ensure that your donation will be used for the victims of this particular disaster. Avoid Telemarketers: Be wary of fundraisers who pressure you to make a contribution over the phone. Never divulge your credit card information to someone soliciting you via the phone. Instead, ask the fundraiser to send you written information about the charity they represent and do some research on your own. Once you feel comfortable with the charity, send the organization a check directly in the mail, or give through their website, thus ensuring 100% of your gift goes to the charity and not the for-profit fundraiser. Research And Follow Up: As always, take the time to find a charity you can trust. Be sure to follow up with the charity in a few months to find out (a) how your donation was put to use and (b) if they need additional support to complete the recovery effort. 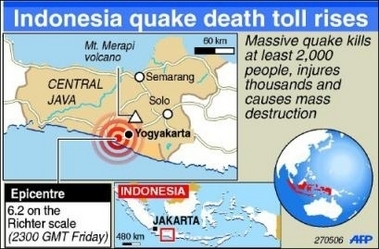 The magnitude-6.2 quake struck at 5:54 a.m. near the ancient city of Yogyakarta, as most people were sleeping, causing death and damage in many nearby towns. One geologist warned that the temblor could spark a large eruption at nearby Mount Merapi, one of the world's most active volcanoes. Houses, hotels and government buildings collapsed, sending hysterical people running through the streets. Many roads and bridges were destroyed, hindering efforts to get taxis and pickup trucks filled with wounded to hospitals overflowing with patients. Fourteen hours after the quake struck, the number of dead stood at 2,914, said Social Affairs Ministry official Sopar Jaya. An official at the social affairs ministry's disaster relief centre said at least 3,002 people were dead and more than 2,500 seriously injured in the quake on the south coast of Java island. The Indonesian Red Cross said some 200,000 people had been displaced. The death count was being updated almost by the hour. Victims who survived went streaming into overwhelmed hospitals, bloodied and terrified, as tens of thousands more were left homeless around the ancient city of Yogyakarta on Java's densely populated south coast. NSNBC reports the death toll from the Indonesian eathquake now stands at more than 3,500. A bipartisan Senate investigation concludes the Federal Emergency Management Agency cannot be fixed and recommends FEMA be replaced. The Associated Press reports the recommendations of a seven-month investigation to be detailed in a Senate report to released next week propose creating a new agency, called the National Preparedness and Response Authority, that would plan and carry out relief missions for domestic disasters. Maine Republican Senator Susan Collins, who led the inquiry, described FEMA as a "shambles and beyond repair." Many of the 86 recommendations were far less dramatic. The recommendations range from creating a Homeland Security Academy to better trained relief staff, to encouraging people and state and local governments to plan for evacuating and sheltering pets during a disaster. It's hard to defend FEMA, but I don't understand how replacing FEMA with a new agency will improve our ability to respond to a disaster on the scale of Katrina. I think we would be much better off with an agency that helps local and state governments develop plans for disater response. We need to regain part of that famous American self reliance. The big lesson of the Katrina disaster is that everyone must prepare to fend for themselves until help arrives. There will be situations, natural disasters or horrific terrorist attack, in which the calvary won't get there for awhile. That's just the way it is. The government can't always provide immediate relief. The City of San Francisco has figured this out. The City's Office of Emergency Services has set up a website called 72 Hours. The site implores you to imagine that you have no electricity, no gas, no water and no telephone service, that all the businesses are closed and you are without any kind of emergency services, then asks what will you do until help arrives? The 72 Hours site offers advice on how to prepare for a disaster and survive until help does arrive. We should all think whether we are prepared and what we would do when faced with a disaster. About $2.3 billion has been collected in the 12 weeks since Hurricane Katrina flooded the U.S. Gulf Coast on Aug. 29, killing more than 1,100 people and displacing thousands from their homes, said Evan Goldstein, a spokesman for the newspaper. This tops the record $2.2 billion that charities received after the attacks on the World Trade Center and the Pentagon, according to the Chronicle. The bulk of the storm aid has gone to the American Red Cross, which had received $1.55 billion in donations for hurricanes Katrina, Rita and Wilma as of Nov. 15, spokeswoman Kara Bunte said in a phone interview. The Red Cross has spent more than $1.63 billion to provide meals and shelter since Katrina, Bunte said. Thanks to all to all who responded to the many pleas for donations.